Next in my series on Papa Dan's Beef Jerky is this Ring of Fire variety, described by the brand as "the absolute hottest beef jerky you will find anywhere." Papa Dan's is a brand of jerky belonging to Fullerton, CA-based Batistelli Foods. Read my previous review of their Carne Asada Beef Jerky. While Papa Dan's is focused as a beef jerky brand, it's website also sells nuts, sauces, and candies from other brands. This "Ring of Fire" variety from Papa Dan's is not associated with the Ring of Fire Beef Jerky that I reviewed last year. This one is made by TM Jerky & Processing, Inc. of Monrovia, CA, while the Ring of Fire Beef Jerky I reviewed earlier was made by J.C. Rivers. Beef steak, water, seasonings (salt, sugar, brown sugar, maple sugar, sodium nitrite), spices, teriyaki sauce, worcestershire sauce, liquid smoke, monosodium glutamate, salt. The first thing I taste off the surface of these pieces is a slight sweetness, that quickly gives way to a strong chile pepper flavor. The burn from the chile pepper comes on strong and quicky as well. With some sucking, I can sense saltiness. As I start chewing, I get a stronger saltiness, and not much else. Ok, so is this jerky the hottest jerky I'll find anywhere? Well, it's indeed hot, very hot. I'd classify this as "very hot" on my hot scale. My eyes are watering, my scalp is perspiring, and my sinuses are running. I'm getting a sharp burning on the tongue. Looking back at all the jerky brands I've reviewed, this is in fact the hottest jerky I've ever had. I'm someone who says can tolerate hot foods, but this is so hot that I'm having to take a break. I took just one bite from one piece, and I need to stop for a moment. As I continue writing, I feel sweat running down my neck. Considering there is 8oz of this jerky, it's going to take a long time to eat this. And as I said above, I'm getting a lot of chile pepper flavor as well. That flavor dominates the surface flavor, but I'm not sure it dominates the chewing. Once I started chewing, I was getting a good deal of saltiness. At this point, it's a draw between the chile pepper flavor and the saltiness as to which dominates the chewing flavor. This jerky also has a decent amount of chile pepper smell. The natural meat flavors are light in taste. I get some taste, but in some cases, the extreme hot, and the saltiness make it difficult to enjoy what meat flavors there are. I don't really taste the teriyaki and worcestershire sauce listed in the ingredients. It could also be that the chile pepper and salt have such dominance that it's hard to find. Considering I've only taken three bites so far, I'm not sure I can write a sufficient review. But that's perhaps a testament to how hot this jerky is. To sum this up, what you'll taste in this a slight initial sweetness that quickly gives way to a strong chile pepper flavor, and good chile pepper burn. Once you start chewing, your teeth will bite into the chile pepper flakes and seeds and you'll get a sharper stronger burn. You'll also experience a good deal of saltiness in the meat. That's about all you'll taste. These appear to be slices of whole meat, sliced into thick strips and chunks ranging from 1/2 to 1 inch wide and 2 to 3 inches in length. This is a moist and soft jerky, that cracks open rather easily. The meat is filled with chewy sinews that make it difficult to bite off. I have to grab on to a piece rather tightly, and then chew and twist to get it to bite off. The meat itself is actually soft and easy to chew, it's the sinews that get in the way. The chewing texture starts out very much like a stiff piece of meat, just as you would expect beef jerky to be. It doesn't feel rubbery or gummy at all. As I chew it down, it feels just like a piece of steak, cooked medium. It's not crumbly at all. It's actually a very good chewing texture, minus the chewy sinews in the meat. I don't see any pieces of fat on this jerky, and I don't get any tendon or gristle. But each bite I take seems to contain those sinews I talked about. Pretty much every bite I take leaves behind wads of unchewable tissue. This jerky can also be rather messy. Because of the sinews in this meat, I have to grab onto a piece with some force to bite off, and that leaves a good deal of oil and chile pepper on my fingers. And then chewing and pulling a piece off with my teeth causes some chile pepper flakes and seeds to fall off on my lap and desk. Papa Dan's sells this Ring of Fire variety from its website at a price of $14.99 for an 8oz package. I bought this 8oz package, along with an 8oz package of their Carne Asada variety, for a total of 16oz. After tacking on the shipping fee, the total came out to $36.94. That works out to a per ounce price of $2.31, putting this into the expensive price range. For general jerky snacking purposes, at the $2.31 price per ounce, it's a fair value. 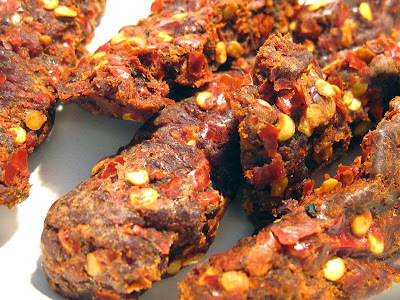 If you're among the 80% of jerky snackers out there with average tolerance for hot foods, you might this find difficult to eat because of how intensely hot this is. It may take you several days to finish off an 8oz package, and unfortunately, an 8oz package is smallest size Papa Dan's offers. And worse yet, it doesn't come in a resealable bag. You'll have to move this to a ziploc bag, and keep it in the fridge. As for being a hot jerky, at the $2.31 price per ounce, it's an excellent value. If you want to spend money on a really hot jerky, I'm not sure I've found anything hotter than this. On top of that, you'll get plenty of chile pepper flavor. First, I'm getting a good deal of snackability from this, mainly because I personally love spicy hot food, and second because I love the flavor of chile peppers. And considering I'm getting lots of chile pepper hot, and chile pepper flavor, this jerky scores a lot of points with me. The meat consistency is actually pretty good, except for all the chewy sinews inside. The meat itself actually has an excellent chewing texture, it's just that those sinews get in the way. If you can look past that, you'll love the meat consistency. 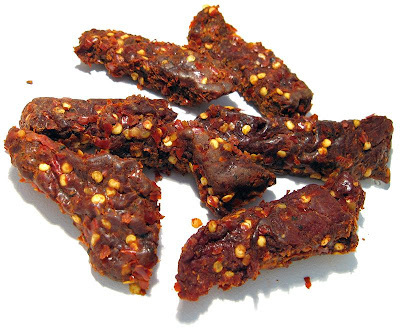 This is a jerky for people who have to have something SO hot to get the endorphin high they crave, or someone who needs the intense chile pepper taste. I actually think it's delicious, but hard to snack on. And it's really pretty simple in taste, just chile pepper, salt, and light meat flavors. But if you're frustrated in buying jerky advertised as "hot" and only getting something medium at best, definitely buy a package of this. At the end of this review, I've only eaten two whole pieces, and my hair is soaked with sweat. I just can't eat this any faster. Keep a paper towel handy to dry your eyes and wipe your forehead. Definitely a smooth creamy stout will pair up well with this.